Christy Kroboth gave up her career as a dental nurse to focus on animals with a lot more teeth - alligators. When she started training as an alligator catcher she was the only woman in her class, but - as she describes here - that made her even more determined to show she could jump on an animal many times her size, and tape its jaws tightly shut. When I first got my licence I was only doing this as a hobby, I'd go to work as a dental assistant and catch my alligators on the side. But I got well known for taking the alligators alive, and I'm now doing this as my full time job. I've been a true animal lover all my life. I blame it on my mom. When we were little she was the one that would stop the car, pull over, and help turtles and ducks cross the road. We took in all the strays - cats, dogs, whatever needed a home. Where I live in the south part of Texas we have a lot of alligators and there are these big master-plan communities that have manmade ponds and these ponds have alligators in them. The homeowners are so afraid that they're going to eat their kids and that they're going to eat their dogs, but in the past 100 years we've only had one person killed by an alligator, so it's all just superstition. These alligators have been around since the dinosaurs. They're great for the ecosystem, they keep all the aquatic life in check. They're actually really shy animals and they don't want to hurt anybody. But people think of these guys as monsters. They have this vision in their head, and when I noticed this I thought, "What can I do to help change people's mindset?" You can't just go out and catch an alligator because alligators are protected by the state here in Texas. You have to have a special licence and a permit. I registered to be an alligator hunter with Texas Parks and Wildlife and we had to go through a whole training course. I was the only girl in the class and also the youngest. We had to go through the rules, laws and regulations, and then the trainer told us: "OK, you've all passed the paperwork, now let's go do this hands-on." I'd never even touched an alligator before and for a split second I thought, "I can't do this." I called my mom and I said, "Mom, I can't do this!" And, of course, mom is like, "Come home right now, don't do it!" But something told me: "I have to do this - not only for the alligators, but to prove to these big ol' country boys that I can." I ran out to the pond, got the alligator, taped him up and ended up passing the test. It was one of the happiest moments of my life and that adrenaline rush lasted the whole day. The biggest alligator I've ever caught was a 13ft (4m) male weighing more than 900lb (408kg). I'm 120lb (54kg), so he outweighed me by a good amount. He was blind and lost in a parking lot and could not find his way back to the water. Usually we catch alligators by grabbing their jaws with both hands. Once you feel comfortable enough you let go with one hand and you reach the other hand into your pocket, grab your electrical [insulating] tape and tape his mouth shut. You've got to move fast. Well, this alligator was so big that my hands would not fit around his jaws. I was trying to call my buddies to help, but it was six o'clock in the morning and none of my volunteers were answering. 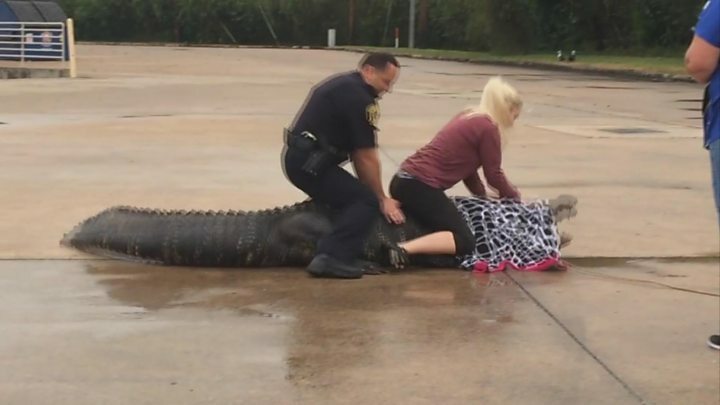 I was able to sucker one of the local cops into trying to help me, but he didn't want to put his hands around the alligator's mouth, which is understandable. Another way to catch an alligator is to try to outweigh them by jumping on their back, so I talked this poor cop into jumping on to the back of this alligator with me. The trick is you put all your weight down and sit completely down on the alligator. Well, the officer didn't and he kind of just danced around the alligator which any untrained person probably would. The alligator didn't like that, so he started wiggling around, trying to get away. I knew instantly this was not going to work, so I stood up to back off and the alligator swatted me with his tail and made me fall on my bottom right there beside his un-taped mouth. We were all worn out from trying to catch this alligator for four hours, the parking lot was getting busy and stores were starting to open so I had to make the decision to call in a game warden. I got very sad because game wardens usually don't come out and catch alligators, game wardens usually come out and kill alligators. I went to my car and I started crying because I'd been defeated by this animal. I called the game warden and he said, "Christy, stop crying. I am going to come help you. Do not touch that alligator until I get there." Well, when he said that I just got so much energy, I was so happy. I got out of my car like I could just conquer the world because somebody was coming to help me. 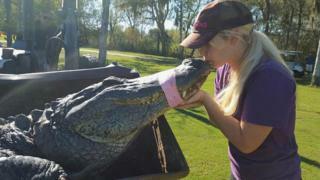 Somehow I was able to go up to the alligator and hold his jaws in my arm and tape his mouth shut with my right hand. We ran to Home Depot and got zip ties to tie the alligator's hands behind his back like he was in handcuffs so he couldn't walk off. Then the game warden showed up and he said, "I told you not to catch him!" I said, "I'm sorry, I just had all this confidence and I was able to do it!" We had to borrow a forklift to pick the alligator up and load him in to my buddy's truck, because he was so big. Potentially dangerous alligators that cannot be released back into the wild are taken to a farm with tons of acreage and tons of ponds. But if the alligator can be released in the wild we have certain release sites where we can drop them off. I have an SUV and sometimes the smaller alligators will want to climb over the seats and try to make their way to the front to help me drive, so it's me and the alligator waving at people going down the freeways. I've found out if you make it freezing cold in your car the alligators are calmer. So although it's the middle of summertime here in Houston - 97F (36C), humidity - I'm on the freeway in a jacket with gloves and a scarf and a blanket wrapped around me because my car is freezing cold. But the alligator is behaving, so that's all that matters. Sometimes they go to the bathroom, and alligator poo is not that great, so we'll have to roll down the windows and travel on down the road. Being the animal lover I am I think it's very important that we educate everybody on the animals that are living in their backyards and help them understand that we can all live together. I have three educational alligators, their names are Cam, Taylor and Halo. We call them our "edugators" because we take them to schools and we teach people alligator safety and alligator education. I work with these alligators every single day, they're used to being handled so they don't see us as a threat. They'll even sit on the couch and watch TV with me when they're not in their enclosures. When I go out on a catch sometimes there's a very afraid person there whose mindset is changed. They may say, "Oh, I understand his importance now, I like him, let's name him." When I see that change in people that's what really drives me to do what I do. That's why I wake up and why I do my job every single day.